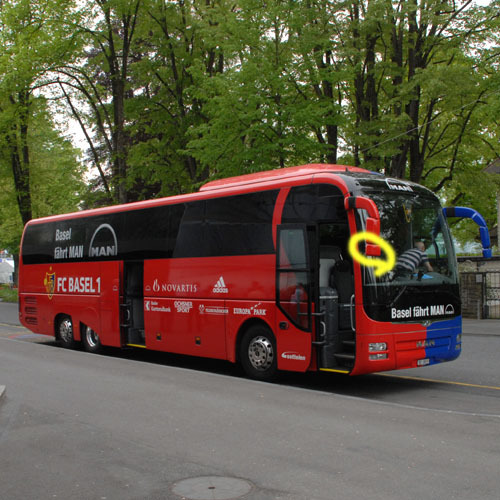 The team bus of FC Basel makes a smart image for the photo game of spotting a difference in pictures. (It is best to call it a ‘bus‘ in English, as otherwise the term ‘team coach‘ can get confused with the manger / trainer of the team!) 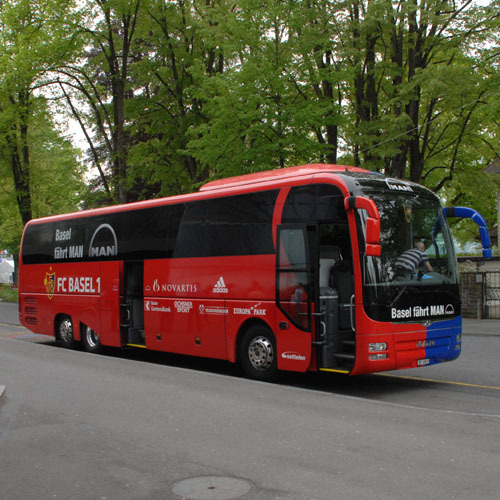 Notice that the bus is painted in the team colours – they are known as the ‘RotBlau’s (Red/Blues).The Swiss Super League club ‘Fussball Club Basel 1893‘, to give it its full title, plays at St Jakob-Park in Basel, the largest club stadium in Switzerland (capacity 38,512), though our photograph was taken in Luzern. In the 2015 – 2016 season, FC Basel finished top with 78 points, while Luzern were 5th (or bottom – there are only 5 teams in the Super League) with 47. FC Basel have been in the Champions‘ League six times; they did well in that competition in 2011-2012, getting to the knockout stage after two away draws, and a win at home against Manchester United. They were knocked out on aggregate by Bayern Munich, whom they beat at home 1-0. The following season FC Basel reached the semi-finals of the Europa League, where they were knocked out by Chelsea at Stamford Bridge. Basel are currently managed by Urs Fischer, formerly a player with FC Zürich and another Swiss club, St Gallen, and the holder of the record for appearances in the Swiss Super League with 545 caps. Fischer was captain of both his clubs, and played four times for the Swiss national team. He won the Swiss Cup as a player in 2000, and retired from playing in 2003. Winning the Swiss Super League in 2016 was his first achievement as a manager.